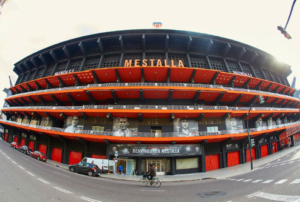 Mestalla, built in 1923, is the oldest football stadium in Spain. 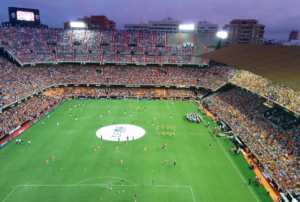 It has been the home of Valencia Club de Futbol since that time and has witnessed them win six La Liga trophies and countless others as well. It holds 55,000 spectators and due to its steep design, provides an excellent view of the action no matter where you are seated. The stadium provides a thrilling yet safe and well-organized experience for the visitor, with well marked gates and seat numbers as well as the usual amenities such as snack-bars and gift-shops. Attending Valencia home-games is a fun, friendly experience which is highly recommended whether you are a die-hard fan or just curious. 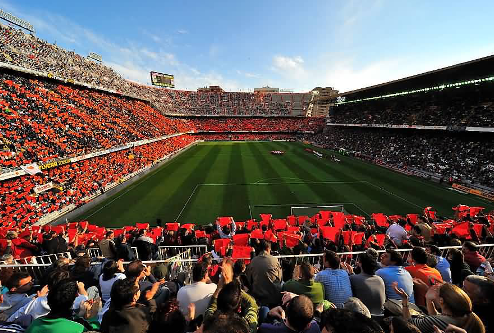 To watch a football game at Mestalla is a fantastic experience that will not be forgotten!